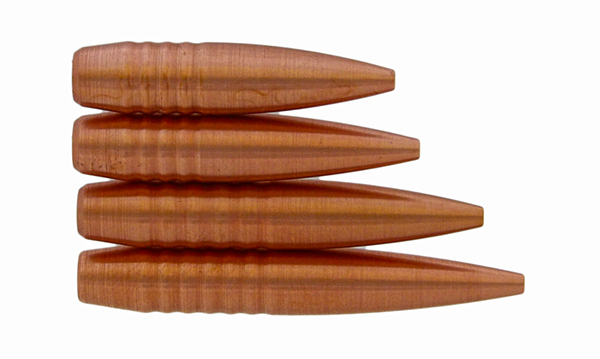 Hammer Bullets are custom turned on a CNC lathe, using only the highest-quality solid copper appropriate for the desired result. Each bullet is weighed and micrometer measured as it is produced. The result is an incredibly consistent product with unparalleled quality control. Hammer Bullets are available for both target shooting and hunting applications. We can quickly produce virtually any custom caliber and grain your rifle can support. The hollow point design, intended for big-game hunting application, initiates expansion upon impact, shedding petals immediately, with the remainder of the bullet staying intact with a blunt front for optimal wound channel. The different bullet lines that we have currently are the Sledge Hammer, Hammer Hunter, Target Hammer, and the DeadBlow Hammer. We have a couple others that we are working on that will be coming in the future. The Sledge Hammers are our line of bullets that we designed for normal range hunting, where bc is inconsequential. So for most cartridges 400y or less. The Sledge Hammer line is approximately an 80% weight retention bullet that has a larger hollow point for super quick opening on game with high retention for long straight penetration. The Hammer Hunter line is our long range or high bc line of bullets. This was the original line of bullets. These bullets all have 1.5mm hollow point and are typically 60%-70% weight retention. There is no drop off in terminal performance from the Sledge Hammers. The only difference that we see on game is the Sledge Hammer will open up slightly quicker. We designed the Hammer Hunter with the 1.5mm hp as it was the smallest that we could get reliable expansion. We tried 1mm hp but it would not always do what we wanted on game. Failure is not an option. As far as we know there is no report of a failure of the Hammer Hunter to expand on game. There is always that chance and the larger hollow point on the Sledge Hammers reduces that risk. I will be changing the name of the Heavy Hammers to Hammer Hunters. They are for all intents and purpose the same. They are bullets that we came up with for customers that had slow for caliber twist rifles. The goal here was to make as heavy a bullet as we could that still has the 1.5mm hollow point and still get as much bc as we could and maintain proper stability for good terminal performance. They typically have shortened boat tails and more baring surface to increase the weight to length ratio. DeadBlow Hammers are Hammer Hunters that are designed to retain 40%-50% on impact. They simply have a very deep hollow point that causes them to shed much larger nose petals. We have a full line of these ready to go. I just have not had the time to get them up on the website. We hunted with these bullets last fall in MT and had very good results. I’ll be honest, it is not exactly what we think a bullet should be, but we are looking to satisfy those who like a frangible bullet. Because they are pure copper they do not disintegrate like lead core bullets, so meat damage is still very light. The shed weight comes of in a few large pieces that do their own work. Think of 4 little 25g bullets along with the retained shank all penetrating deep in the animal. On game performance was actually very good. These bullets will be a bit more expensive due to the fact that is takes so long to drill the deep hole. If anyone is interested in DeadBlows shoot me a note. We can fill orders I just need to know what you are after. Target Hammers are pretty self explanatory. Non expanding bullet designed for shooting targets not game. The bearing surface of the bullet incorporates the patented PDR design (parabolic drag reduction). A continuous up and down curve, from the shoulder to the boat tail, reduces friction in the bore which equates to decreased pressure and the ability to achieve higher velocities. The PDR design on the bearing surface has proven to be very consistent and forgiving for the hand loader. Seating depth adjustment for accuracy has been unnecessary, making for much less time spent creating an effective load. Load development is as easy as shooting for velocity and then confirming point of impact. We can provide a Hammer Bullet to meet the varying needs of each customer. We can design a specific bullet for use in non-standard twist rates. If you have a faster or slower twist for a given caliber, contact us and we can discuss a bullet for your needs. We have determined that our bc ratings will be listed in G7 form. G7 form is for use with pointed, boat tailed bullets. G7 bc values have much less dependence on velocity and remain accurate throughout the flight of bullet as it slows down. G7 bc values remain constant regardless of the starting muzzle velocity. We will always give bc data intended to help our customers get on target at distance. We will never inflate our bc values in order to look better. When ever possible we will list bc values calculated on our own testing using drops shot at long range. Some of our bullets will be listed with an estimated bc value. This will always be conservative. All of our bullets are, or will be, tested by Bryan Litz of Applied Ballistics. Our bc values will be listed as Calc, Est, or Litz. Always remember that bc can be effected by twist rate, individual rifles, and atmospheric conditions. So we recommend shooting at different ranges to verify your drops. Our goal is to make this as easy as possible by giving a bc value that is accurate. Each of our bullets has a recommended minimum twist rate. This is calculated at sea level using the Miller Twist Rule. The recommended minimum twist rate is based on a gyroscopic stability factor (SG) of 1.5. An SG of 1.5 or higher is needed to achieve full bc value and expected terminal ballistics. In our testing of low velocity terminal ballistics we have found that marginal SG (less than 1.5) hinders a bullets ability to stay on track and open reliably at minimum impact velocities. SG factor of 1.5 or higher will keep a bullet oriented point first on impact and promote proper deformation of the frontal area for good terminal performance. Marginal SG of less than 1.5 will cause less than listed bc value. With that said, it is not necessary to have an SG of 1.5 or higher for good accuracy. An SG as low as 1.2 can still provide excellent accuracy. A reputable ammunition loading manual should be consulted for load development using a particular powder. Always follow good loading practices outlined in your loading manual. Our PDR design will tend to have less pressure due to less bearing surface contact with the bore. We recommend looking for a powder showing fairly high load density for similar weight bullets, but not compressed. We also recommend using a magnum primer to start ignition more quickly in order to seal the chamber as the bullet enters the bore. Use of a chronograph to watch muzzle velocity compared to similar weight bullet velocity listed in loading manual will aid in load development. Muzzle velocity should not exceed max load velocity listed for similar weight bullets listed in loading manual. Muzzle velocity is an indication of pressure. Always watch for known pressure indicators such as heavy bolt lift or ejector marks on brass as well. We have found that Hammer Bullets are not sensitive to seating depth. Seating to mag length for repeating rifles or just off the lands will generally work very well without need to adjust for better accuracy. Load development should be easy. 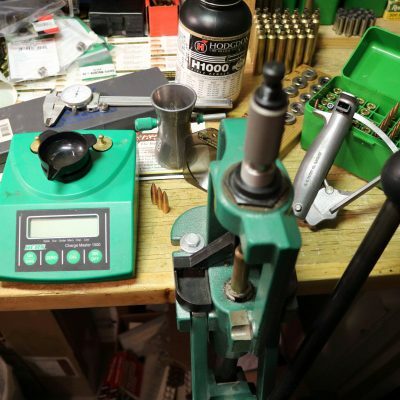 Find your seating depth, choose your powder and primer, use start load data and work up your load to desired velocity, sight it in, and have fun hitting it with a Hammer. Hammer Bullets are constructed lead free. They meet restrictions set in areas that do not allow the use of lead for shooting. There are many benefits for the environment and our health when we reduce the use of lead. Lead is a toxic substance that has detrimental effects on humans and animals. Use of lead free bullets keeps our ranges cleaner and our harvested meat safer for consumption. We at Hammer Bullets came to use of lead free bullets years ago when we simply wanted a better bullet construction for harvesting animals without the wasted meat that comes from frangible lead core bullets exploding on animals and ruining edible meat. As hunters we hated to see a good shot on a big game animal that would cause blood shot meat that was not even in the point of impact. To shoot a deer in the lungs perfectly broadside, and then recover the animal only to find the onside shoulder blood shot and wasted, was very dis heartening. Our all copper, lead free bullet design causes dramatic permanent wound damage to soft tissue without the blood shot meat near the wound. We feel that the utilization of as much of the game animal for consumption as possible, is the greatest benefit of using Hammer Bullets. We at Hammer Bullets have too much respect for the animals that we hunt to risk unnecessary meat loss due to inferior bullets. Below is a link to a study done by the Minnesota Dept. of Natural Resources that we think is worth watching. We are offering a 10% military discount for current and former members of the military. At checkout there is a button for coupons. Just click this button and the coupon will show. This coupon is on the honor system. Anyone using this coupon that is not a veteran, is a turd.